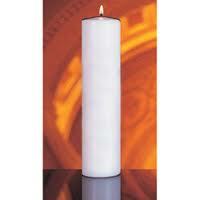 3" x 14" White Ceremonial Pillar that may also be used as a Christ Candle. Comes with a Spike Hole End. Christ Candles are a symbol that Christ is present whenever two or more people are gathered. It is traditionally burned during Advent as well as prayer council meetings, scripture study sessions, etc. This makes a meaningful addition to an Advent Candle Set.